Just before mid-summer the Elder blooms in Minnesota. Elder blooms in the warmer city in early June and in the countryside in mid to late June. Elder is an exceptionally useful herbal remedy, all those interested in herbalism should learn its habits and preferred locations. “Red is dead,” is the mnemonic used to help guide the wildcrafter to the appropriate species. I don’t know if red is really dead, but it is certainly widely regarded to be the more toxic of the species and is avoided by those in search of Elder for medicine and food. Students are sometimes worried that they won’t be able to positively id Black Elderberry, or that they will get it mixed up with Red Elderberry but it’s really simple. Black Elderberry is a multi-stemmed shrub that spreads by suckering. It is not too tall. A nice mature stand is often the height of a grown-up or a bit taller. I’ve been able to reach the top of every Elder I have encountered. The bark has characteristic warty lenticels. (Students often think this is a 100% unique id characteristic; it’s not. Other plants have lenticels as well, but it’s one of several characteristics that can guide you in the correct identification of Elder.) Black Elder is a loner; it doesn’t like competition. It also likes it a bit wet and sunny. You won’t find this shrub in the woods; if you do it is probably stunted and struggling. It thrives in the ditch and in the low land, out in the open. Drive around country roads in Minnesota in June and you will see the ditches full of Elder loaded with creamy white blossoms. This is the easiest time to find Elder; it’s everywhere and conspicuous. You also find it sometimes in a hedgerow on the edge of a more wooded area. In the city you will often find it along the banks of streams and city ponds and lakes, but again rarely in the shade. Elder grows nicely in the garden. Ornamental varieties are also available with lacy maroon foliage and pink flowers. I can’t vouche for the potency of medicines made from these lovely ornamentals. Elder has a compound leaf with typically seven leaflets (occasionally there are five leaflets.) There is a terminal leaflet. The flowers are in mostly flat topped cluster, often mistakenly called an umbel, but in the case of Elder it’s actually a cyme. The flowers are sometimes described as smelling “foul” or “rank.” I disagree. When I am working among the Elder in my garden I find the smell delicious and lovely. As the flowers mature and begin to drop off, if you stick your face right in the clusters there is a bit of a rank undertone that reminds me of the berries but early in the flowering it is quite nice. Not like a linden or a classic lilac but nice indeed. A few weeks after the flowers come the berries. They start green and ripen to purple. Note that they are never red. They do not ripen from red to purple; they go from green to purple. The clusters of berries are so heavy the droop over. The Elder is heavily laden with fruit. The tree offers up so many and to stand among them and simply snap of the whole cluster between your fingers is harvesting at its most gratifying. Let’s return to the Red Berried Elder. It’s about the same size, it also has multistems (although usually less than a black Elderberry but that’s not a very useful id characteristic) and it also has warty lenticels. However, there are many striking differences. Red Berried Elder grows in the woods and in the shade. In some wooded areas in Minnesota it’s quite abundant. You can find shrubs all over the place in close proximity to one another, it’s a good reproducer. The flower clusters are not flat or mostly flat like the Black Elderberry, rather they are a roughly conical shaped raceme. They also bloom before Black Elderberry. You might see Red Berried Elder in bloom as early as April and certainly in early to mid May. And as the name suggests the berries are red, really red, bright fire-engine, lipstick red, not purple at all. You will not mix these two up unless you are color blind. Elder has long been associated with the magical realm and the world of fortune both good and bad. You can read a thorough account of some of the religious, magical and folk beliefs associated with Elder by Maude Grieves, the author of the classic herbal, A Modern Herbal. All parts of Elder have been used historically, but in contemporary practice we confine ourselves to the blossoms and the berries. Bark, root and root bark are generally considered to contain unacceptably high levels of plant constituents that may cause vomiting or diarrhea among other unpleasant symptoms. 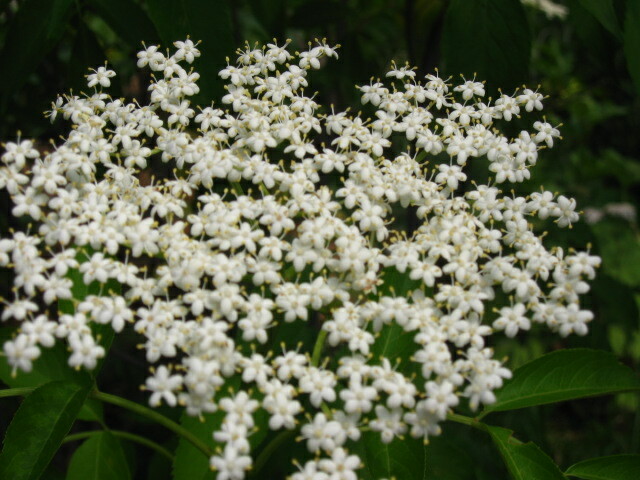 Elder blossom is one of the classic remedies of childhood. It’s one of the first remedies to reach for in the case of fever, upper respiratory infections, ear ache and eruptive illnesses that characterize childhood. Elder blossom is rich in fragrant volatile oils. Volatile oils are often diaphoretics that stimulate the circulatory system. Surface capillary circulation is increased and the pores open and sweat (diaphoresis) ensues followed by relief of feverish symptoms. The old timers would have described this more poetically as opening the vents of the body. You can use Elder blossom with any child or adult who has a fever. You can administer Elder blossoms as a tincture (and it’s a wonderful tasting tincture) or as a tea. “An almost infallible cure for an attack of influenza in its first stage is a strong infusion of dried Elder Blossoms and Peppermint. Put a handful of each in a jug, pour over them a pint and a half of boiling water, allow to steep, on the stove, for half an hour then strain and sweeten and drink in bed as hot as possible. Heavy perspiration and refreshing sleep will follow, and the patient will wake up well on the way to recovery and the cold or influenza will probably be banished within thirty-six hours. Yarrow may also be added”. This tea combination really works. Try it sometime. It’s also available as the basis for the blend called Gypsy Cold Care by Traditional Medicinals. It’s so easy and pleasant to harvest Elder blossoms that I often harvest some for the purposes of drying. When my children were little I used them for Elder blossom baths when they had fevers or upper respiratory infections. Now that we are past that phase, I provide the blossoms to my clients with young children. Sweating is a traditional worldwide practice for the treatment of fever. Herbs can aid in diaphoresis. In the traditional healthcare practices around the world there is a history of using herbs on the outside of the body to treat the interior. I take some muslin or cheesecloth put a couple of good handfuls of Elder blossoms in the middle ( if the child is particularly crabby, add some Chamomile) and secure it with a rubber band. This keeps the tub clean and makes things easier on the overworked parent. Run a reasonably hot bath, with the Elder sachet in the water. You are basically making a big tea for the child to bathe in. Put the child in the bath. Don’t allow him to get his head wet. If he gets his head wet you won’t see when a sweat is produced. After a sweat is produced, take the child out of the tub and wrap them swiftly in a towel and keep the head covered. Pop into bed all bundled up to keep the heat going and the sweating going for a while. Research shows both Elder blossoms and Elderberry to be anti-viral and that both parts of the plant improve immune system function. 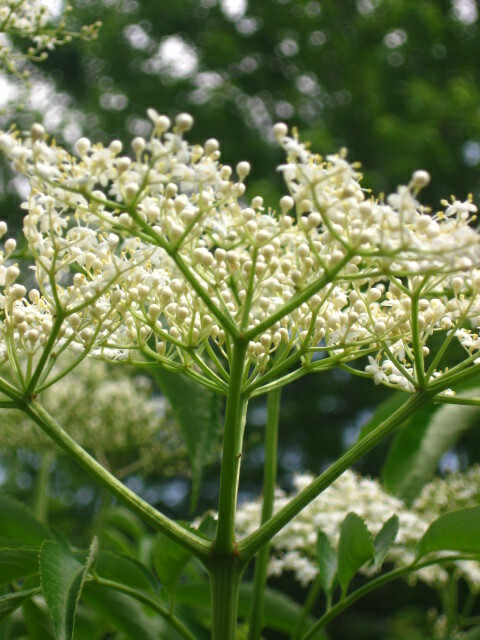 Elder blossoms have been traditionally used to treat childhood illnesses with a rash. Many classic illnesses of childhood such as measles, rubella, chicken pox, scarlet fever, fifth’s disease and others are characterized by a fever and a rash. Elder (and other remedies) are used to bring out the rash. In traditional practice a large rash is seen as a positive response of the body to illness, a sign of the body’s strength and vitality. Eruption on the exterior of the body is viewed as safer for an individual than having a high fever where heat is locked in the body. A rash is a body on the way to improvement. You will find repeated references in the old literature to herbs that bring out the rash. This makes common sense, as one of the more serious side effects of some of the above illnesses brain inflammation called encephalitis. While Elder is effective as a diaphoretic for most individuals with an acute respiratory infection it is particularly healing for children and adults who have “closed” skin. By closed skin we mean those children and adults who seemingly don’t sweat or sweat very rarely. In these cases, Elder may help transform the pattern of chronic fevers or respiratory infections. Matthew Wood writes that these people have “weak peripheral circulation” and that Elder works profoundly on them by “reducing heat, opening the pores and dispersing the blood in people with dry, irritable, red skin of the cheeks, of the face and “cheeky” parts of the body. There are tendencies to fever and eczema from the closed pores. Sambucus is constitutionally indicated in persons with dry, red irritable skin of the cheeks with a blue cast across the nose or by the eyes or prominent blue veins or blue, swollen edema. .. Another indication is full, slightly puffy skin, mottled red, blue and white, especially visible on the arms and legs. Elder opens all the tubes of the body (skin, lungs, colon, kidneys, blood vessels), improving oxygenation, blood flow, perspiration and elimination by the colon and kidneys”. I use Elder often with these little red-cheeked, closed skin children. They are typically fair-haired. One or both cheeks look so red and harsh as if the child has chapped skin of the cheeks or has been slapped on the cheeks. Mothers will report that the child looks like that often particularly when sick or after physical exertion. These children seem to rarely sweat or sweat is scanty. There are often chronic fever, ear infections (one cheek becomes inflamed on the infected side), chronic respiratory infections, asthma, eczema, allergies, hyperactivity or attention issues. Elder is a remedy for the scourge of atopic illness. Because of its’ pronounced ability to move blood, Elder also finds a valuable place in the treatment of gynecological conditions, particularly endometriosis and fibroids. The woman should fit the Elder profile described above of pale skin, splashes of redness or inflammation, dry skin, blue veins or blue cast to the tongue, lots of menstrual bleeding. These women tend to be estrogen dominant types with strong hormones and feminine body types. In my practice, I have not had luck using herbs to substantially shrink or rid the body of such dense growths as fibroids however, herbs often control the symptoms including flooding very well. Endometriosis responds well to herbs. It is often possible to effect symptom relief and healing of this condition with well chosen herbs. These pelvic conditions respond well to Elder blossom and Yarrow pairs well with Elder blossom for these conditions. You may also consider Elder for other women’s health issues when the person fits the profile. 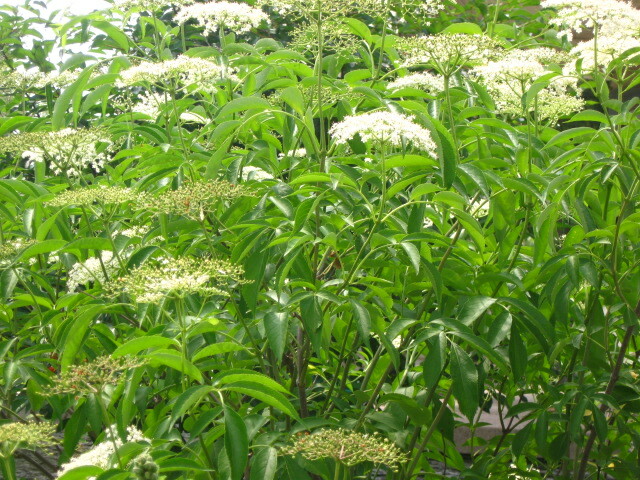 There are many indications for use of Elder blossom preparations and the leaves of the Elder shrub for external use. I don’tuse it externally because we have so many other fine local and abundant plants for first aid including Plantain, Yarrow, Chickweed and so on. However, common uses in the herbal literature include inflammations of the eye and mucosa, strains and sprains, chilblains, sunburns, hemorrhoids and other irritable skin conditions. Information in this post come from personal and clinical experience and the following texts: Trees and Shrubs of Minnesota by Welby R. Smith, Flower Power by Anne McIntyre, The Earthwise Herbal ..A Complete Guide to Old World Medicinal Plants by Matthew Wood, Medical Herbalism by David Hoffmann, Herbal Medication by A.W. Priest and L.R. Priest and A Modern Herbal by Maude Grieves. Thank you for writing this! I learned so much and I didn’t need 30 tabs open to do it. Hi Tasha, I’m glad you like the Elder article. To be honest, I have very little experience using herbs with animals. I do doggie consults when people pretty much only when people beg even after I’ve disclosed my lack of experience. Animals do seem to respond well to herbs, both those I’ve worked with and the stories I hear from my students who work with animals. Elder might be a nice choice for cat. You might also consider Mullein, which is very safe and gentle but also a profound remedy for the lungs. Lobelia is one of the most famous respiratory anti-spasmodics but I would do a lot of research before giving it to an animal as small as a cat and if you do use it, use it in very low doses because it is strong and while perfectly safe for humans in recommended doses can cause adverse effects at higher doses. A couple of my other favorite local respiratory herbs you might want to look into include Spikenard, which I find is good for asthma and labored breathing, Red Clover, Elecampane, Pleurisy Root. You might want to consider powdered herbs mixed in something delicious the cat loves, like wet cat food instead of dry because it might be difficult for kitty to metabolize the alcohol in tincture.